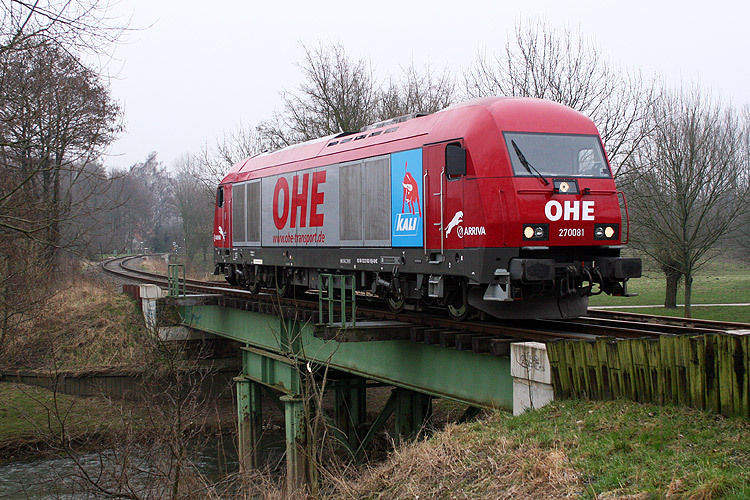 German rail freight operator Osthannoversche Eisenbahnen AG (OHE) ordered three EuroRunner locomotives from Siemens in 2007. Within three months the first machine was ready for service. All three machines are taken out of a batch built in stock by Siemens, to make very short delivery terms possible. The EuroRunners, designated as the OHE 27008x series, are the first new locomotives for German private operator OHE, part of Arriva transport. At the end of July unit 270080 was officially presented in Celle as the first new machine. This was done by exposing the new logo of this OHE locomotive type, a jumping 'panther', combined with Arriva logos. Note that the OHE already exploits red and silver 'Tigers' in the form of Bombardier DE-AC33C diesel locomotives. In August 2011 unit 270081 arrived in Celle, followed by loco 270082 in November. In August 2012, the locomotives became part of the newly incorporated OHE Cargo. In February 2008, an agreement was signed between K+S and OHE to continue their long-lasting cooperation (since the year 2000) for another three years. The deal included the operation of trains from the K+S Sigmundshall factory in Bokeloh to Wunstorf, where they were to be handed over to DB Schenker Rail. To celebrate locomotive 270081 was decorated with a K+S logo.